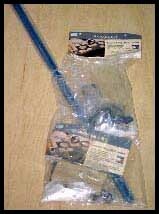 Product: The product reviewed was Rockler's Multi-tool Rail JIG IT (Product #31126, $59.99), referred to below as the MTRJI and described in Rockler's current catalog as for drilling multiple cup holes on a door with a single set-up. It minimizes set-up time and eliminates hinge space variations from door to door. Summary: This is a helpful new system for speeding the accurate installation and uniform positioning of European style concealed hinges on frameless and face frame cabinet doors. A few shortcomings hamper convenience but are generally easy to work around. 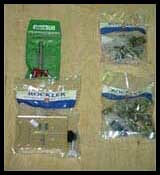 Ancillary items supplied by Rockler were one Mounting Plate JIG IT "A" template (#31350, $9.99) and one Stern brand 35mm carbide hinge cup bit (#10117, $27.99), plus two pair of very nifty Blum 100 Snap Closing Half Overlay Clip-on Hinges (#11209, $8.49/pr.). While not the subject of this review, each of these items performed it's intended task well when used in conjunction with the MTRJI. Expectations: Entering this review, my expectations were for a cost effective, easy-to-use system to simplify the task of installing concealed hinges in doors and cabinets, improve accuracy and consistency, reduce the potential for error, and boost efficiency on repetitive jobs. Packaging: Packaging excesses can bring a chuckle, and the MTRJI is no exception. By my count, the MTRJI came packaged in no less than twelve plastic bags (excluding those for the drill bit, Mounting Plate JIG IT, and hinges), with the 30" tool rail taped to the largest. Presumably this is for the convenience of our friends at Rockler, which also sells several of the kit's components on an unbundled basis. It isn't very convenient for the user, who must mix and match the parts in order to assemble the jig. But if it helps to keep the cost down, then I suppose its worth the small nuisance factor. Components: The cool blue aluminum tool rail, steel jig plates, wooden handles, and sturdy plastic drill bit housing are precisely manufactured and fit together firmly without slop. Together with the positive grip of the included De-Sta-Co clamps, they positioned and held the hinge cup bit exactly where needed for proper boring without deflection (see Photo 3). 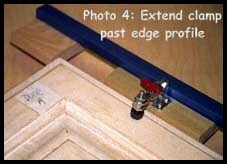 Note: The maximum reach of the De-Sta-Co hold-down clamps limits their use to cabinet doors with edge profiles extending in no greater than 7/8" from the doors edge. The handles used to attach the jig plates to the tool rail were made of poplar instead of the (denser) red oak used for the stop block and shown on the package label. This wouldn't matter if the jig plates were to remain attached to the handles, but in fact they must be unscrewed and repositioned on the handles every time the jig is switched between frameless and face-frame applications. Since precise positioning is the point of this jig, I'd like to see screws larger than #6 or handles denser than poplar. For some reason, one of the wooden handles had pilot holes drilled for both frameless and face frame applications but the other was drilled for frameless applications only. Neither handle had pilot holes for mounting the De-Sta-Co hold-down clamps on the underside. While the wooden handles fit snugly in the tool rail, the stop block fit loosely, enabling it to rotate nearly 1 degree left and 1 degree right of square. This isn't a big deal, but it seems an unnecessary variable. 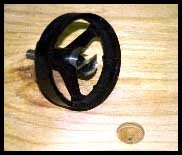 The 1" long T-bolts supplied with the wooden handles allowed their clamping knobs to be backed off several turns without coming loose, but the bolt supplied with the stop block was shorter, inclining it's clamping knob to fall off when loosened for repositioning. 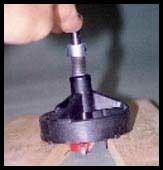 Additionally, while the stop block itself is properly sized for effective use with the hinge cup jig plates, it is undersized for use in positioning Mounting Plate JIG ITs - - allowing only a 1/16" x 1/16" contact area with the workpiece (Note: This use is suggested in the company's catalog but not the product instructions). Instructions: The instructions for assembly and use of the MTRJI are clear and useful but not comprehensive. What's written is good; what's left out is not too difficult to determine. 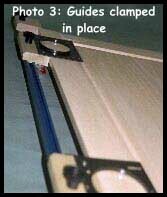 But it would be nice to see instructions for such operations as (a) using the jig plates centering triangles to mark the corresponding positions of hinge mounting plates, (b) adapting the jig for use with hinges other than 35mm Blums, and (c) using the tiny plastic spacers included in the kit (see below). Boring the cup holes: Setting the stop collar to achieve proper drilling depth is the weakest part of the system. To facilitate it, the MTRJI comes with four tiny soft plastic spacers (unmentioned in the instructions, but I think this is what they're for) that fit into matching holes in the base of the drill bit housing to represent the thickness of the jig plate. Equipped with these spacers, the drill bit housing is supposed to be held astride two pieces of wood of identical thickness, enabling the bit to be pressed below the housing to the required cup hole depth (marked on the edge of one of the wooden blocks). Holding the shaft of the bit down to the required depth against the resistance of the drill bit housing spring (which must be fully compressed) while simultaneously tightening the retaining screw on the stop collar is a challenge in dexterity. I would recommend scribing the proper positioning of the depth stop, once determined, on the shaft of your bit. A tapered needle file should work fine. This depth stop setting process seems unnecessarily difficult and I'd like to see Rockler do some noodling on this. But once the depth has been properly set, the jig holds the bit precisely in place and works like a charm. Installing the Hinges: One thing the MTRJI does not claim to do is to aid in the perpendicular orientation of cup hinges relative to the door. A quick way to align the hinges during installation, uses a straightedge laid against the long, back edge of the screw flange. This keeps the hinges parallel to each other for smooth operation. Before you assemble the cabinet, the jig plates can also be useful in determining where hinge mounting plates should be located. Once the appropriate centers have been marked, it is a simple matter to drill perfectly positioned pilot holes using the appropriate Mounting Plate JIG IT (photo #9, for frameless applications) or self-registering hinge mounting plates (for face frames) inside the cabinet. For mirror image positioning of hinge cups on opposing doors, either the jig plates must initially be positioned an equal distance from their respective ends of the first door (a simple but extra step), or the stop block must be repositioned to the opposite end of the tool rail before drilling the opposing door. 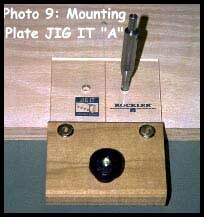 Also, to use the MTRJI for marking the proper location of hinge mounting plates on cabinet sides, the stop block must be repositioned to accommodate (1) any difference between cabinet height and door height and (2) the need to position hinge mounting plates opposite their corresponding door-mounted hinge cups. Face Frame vs. Frameless: Using the frameless hinges supplied by Rockler, I achieved flawless results. Testing the MTRJI with Blum 35mm face frame hinges I had on hand (after relocating the jig plates to the mounting holes designated for this type of hinge), I was equally impressed with the jigs performance. Blum 35mm vs. Other Hinges: The steel jig plates come predrilled with dedicated holes for Blum 35mm hinges (I found them to be perfectly positioned). To accommodate other sizes and brands of hinges, the jig plates have elongated cutouts for custom positioning, which shouldn't be difficult to do. I like the snap-on feature and adjustability of the Blums so much that I probably won't bother to find out. Additional Uses: Not mentioned in the product literature is what has become my favorite additional use for this jig: enabling drill press accuracy while freehand drilling with 3/8 shaft Forstner and similar bits. Held firmly against a workpiece of unlimited size, the drill bit housing provides a solid base for boring clean, crisp holes. Recommendations: For the homeowner or small- to medium-sized cabinet shop that regularly installs concealed hinges, this is a solid product that should nicely take the place of considerably more expensive substitutes (Rockler itself sells one by Fisch for $280, yet it lacks the multi-hole alignment feature of the MTRJI). I plan to give it plenty of use. 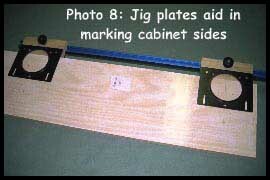 For more information about the Jig It, visit Rockler's website.